In Part One, we delved into the origins of the build sheet from the coach building era and early mass production of cars. Simplicity and bespoke construction were of two different schools and it seemed the twain would never meet. When America embarked on a post war car building spree unlike anything seen before, simple but specific instructions for mass producing cars was needed more than ever before. The build sheet as we know it today emerged. In Part Two, we examine the build sheets of the 1960s to 1970s. By Any Other Name: The manufacturers had different names for them; Ford called them ROT sheets, Chrysler Corporation used the term broadcast sheets, International Harvester called them Line Tickets, GM called them Production Broadcasts or Productions Manifests. The generic name for these papers wound up being build sheets. The basic idea behind all of them was the same. These were assembly orders for putting together a car with the standard and optional ordered equipment. By the end of the 1950s, a lot had changed in the American auto industry. Major investment in post war plants, purchases of auto body plants brought station wagon production in house by the big three. As the 1960s started, more options, body styles and drive trains were in production. The variety of choice was greater than ever before. In addition, some assembly plants made more than two models of cars. A system was vital to make sure the right cars with the right options were built. First, we should address what a build sheet is. I bring this up because I've seen a number of car-documents-for-sale ads for build sheets that were are something else. The most common error I see relates to ads for Pontiac vehicle documents where the seller states he has the build sheet as ordered from Pontiac Historic Services (PHS). The documents PHS actually sells are shipping invoices used for billing dealerships as inventory arrives. These invoices do have a number of critical details found on build sheets such as the VIN, color, trim, drivetrain and major optional equipment sold along with the dealership name and address. There are no details on individual parts that make up the car, no machine code for same and the regular production options are listed along with price of options along with selling price and any manufacturer reductions or markdowns for cars used in promotional or service work prior to sale. While shipping invoices are valuable and document a lot of the crucial information about a car once it was manufactured, it isn't what the assembly line used to build that car. Likewise, a Kevin Marti Report is a shipping invoice from Ford showing the same information. You can get documents from GM Vintage Vehicle Services in Oshawa for Canadian sold cars and they are usually two to three page documents showing major options, selling dealer, colors and drive train combination along with the sales total of that car for Canada. Depending on the year and model, the vintage vehicle service report varies in details and size. Other companies that supply such documents include the Sloan Museum for Buicks, and Cadillac Division in Detroit for their cars. By the mid-1960s, investment in new computers for handling sales orders and processing them for production led to the development of the build sheet. There was a fair bit of variety in styles of sheets as different companies went about formulating sheets for manufacturer's needs. Moore Business forms and IBM were two of the big players in that field. Moore's Formaliner was used for Ford and Mercury products from 1965 onwards. 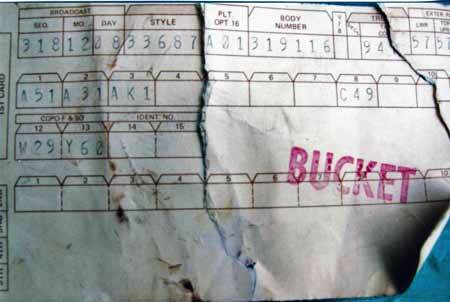 A simple document based on Ford's own part number system and the use of paint daub codes for certain items such as driveshaft identification, speedometer gears, shocks and springs made for an easy-to-read-at-a-glance document for the line worker at his station, able to grab the right part and install within seconds. 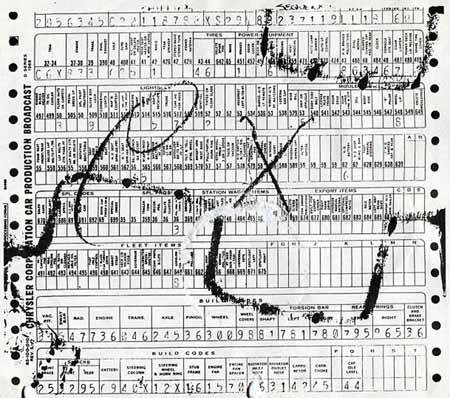 The Formaliner sheet was adaptable to unibody and chassis cars alike with just a change required to certain fields for identifying the relevant parts. 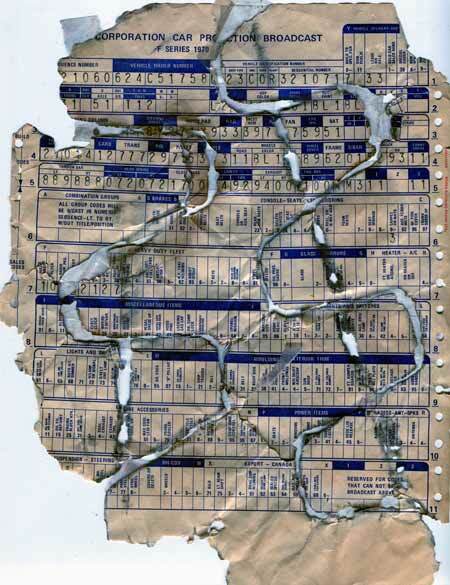 These ROT sheets, as Ford enthusiasts call them, were used on Thunderbirds, Mustangs, Cougars, Galaxies and LTDs. An example of a late sixties Mustang build sheet is shown here to illustrate the format. 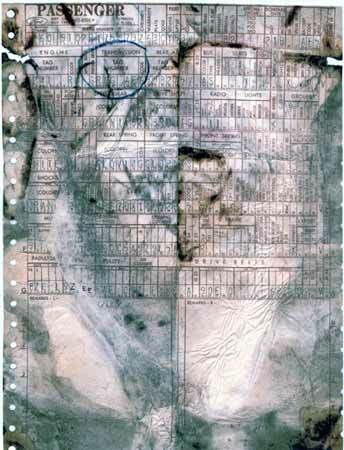 The Ford ROT sheet was a Moore Formaliner sheet which was adaptable for unibody or chassis car applications and appeared in widespread use by 1965.The same system was used right up to 1991 Ford Crown Victorias. Click photo larger view. Moore Business Forms used a variation of Formaliner for the 1969 and later Chrysler Corporation broadcast sheets. 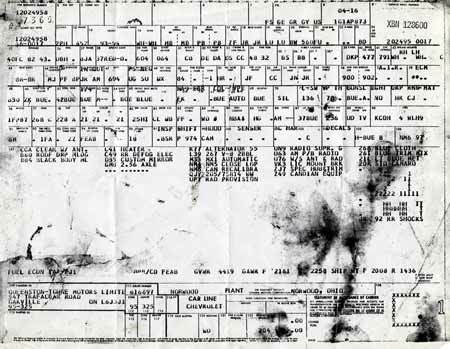 With 1968 and earlier era Chryslers, the build sheets relied on a three number format for identifying parts and a group system to identify parts classes. The 1968 and earlier Chrysler Corporation build sheet was a Formaliner variation that used three number codes and was less easy to read compared to the 1969 and later build sheets. Click photo for larger view. Starting in 1969, Chrysler reorganized this so the sheet was altered to use an alpha numeric system. The sheet was divided into 3 columns in each row. This comprised 6 rows for eleven columns altogether. The rows were labeled; A to C, F to H, J to L, L to M, N to R and S to Z. The first 5 columns, or the top quarter of the Chrysler build sheet are a combination of sales order number, order type, basic drivetrain assemblies coded by the last two or three numbers of the part. From column six we launch into the Mopar sales codes which described the optional equipment or in some cases, mandatory optional items installed in that car. The very bottom blank space was often used for typing memos regarding special orders, or promotional use. This format was used by Chrysler from 1969 to 1983. From 1969 onwards, Chrysler switched to a combination alpha numeric and part number system with sales group codes broken into fields. Chrysler kept this format into the 1980s and American Motors build sheets were very similar. American Motors' build sheets in the 1970s were quite similar to Chrysler Corporations' 1969 and later Formaliner sheets. The ones used for the 1976 Pacer were almost identical in style and basic layout. General Motors used a variety of build sheet formats depending on the assembly plant and type of vehicles made. For the early part of the 1960s the common format was a two page system, one called the Body Broadcast Copy and the second was the Chassis Broadcast Copy. Together, they supplied all the information needed to assemble the car with the right mix of parts according the sales order. Flint and Kansas City plants used these sheets right up to 1969. Fremont was a BOP plant, making Buick, Oldsmobile and Pontiac cars at the same time. Their build sheet was a full page with diagonal rows printing out all the equipment and options by name and a space at the bottom for the printer to stamp if that part or assembly was needed. Fremont switched to a different corporate style of build sheet in 1968. In fact, it appears Fremont was one of the first GM plants to switch to the now familiar corporate build sheet style that showed up on GM cars from 1969 onwards. From Custom Order to Mass Production: Remember at the beginning we talked about how the coach builders and mass production car companies went about building cars their own way and how it seems the two methods would never meet? Well it happened by the end of the 1960s. The new corporate style build sheet was an amalgamation of the chassis and body broadcast copy sheets and the sales order form which used regular production options (RPO) codes for the bottom half of the sheet. The top half was a grid of 106 to 107 fields which were filled either with letters, numbers or actual words where necessary for description. Each workstation was in charge of installing a part and the workers only had to know their particular codes for parts to install. If you were at station 60 installing steering columns for Camaros and Firebirds, you knew what the codes were for the steering column possibilities and grabbed the relevant part from the bins or overhead conveyor and installed it. General Motors switched from the two paged body and chassis broad cast sheets to a simpler one page system by late 1969 called a build sheet. Fremont was one of the earliest plants to switch in 1968. Click photo for larger view. If column 60 had ZK BLUE in it, you installed a base (minus tilt steering and cruise control) blue floor shift automatic steering column. Other workstations used part number codes sorted by the last three numbers as their short hand for installing the right parts. If the station didn't have to install anything, the space was often marked with a dot or an asterisk. By the time the car cleared station 107, all the basic equipment was installed and it was time for options. By 1969, GM was able to build several variations of a car model without repeating itself and the build sheet kept the assemblers from messing up, for the most part. The RPO options were the ones listed in the salesmen's order form for that car series. The completed sales order is sent to the sales office where it's fed into a computer that checks it for discrepancies and incompatible equipment. If it passed, the form was coded and sent to the appropriate plant for manufacture. The correct body is made by Fisher Body, given an order number and placed into rotation at the assembly plant if it happened to be all in one location such as Pontiac in Michigan. Otherwise, the body is shipped to the plant and put in queue for assembly. Some unibody plants assembled the entire vehicle in one plant; others followed the same procedure as a body and chassis car. Where to Look for Them: The top half of the GM corporate build sheet fields 11 to 107 are filled either with alpha numeric color codes or three numbers of a part number for a specific piece. This short hand allowed the workers at each station to add the right parts fast and allow the car to progress to the next area. Once you reach the bottom half of the build sheet, it's all Regular Production Option codes and easily understood for the most part. There is a lot of repetition on a build sheet; the part number short hand, the color coding and two to three letter code for certain parts in the top half is replicated again in the bottom half by the production option codes. This is quite fortunate as many owners have discovered over time that the build sheet survival is a tricky thing after 40 plus years! What you need to know is the factory never intended these instructions to be left in the car. Most copies were discarded as soon as the job was done. The reason a few survived is due to the inconvenient places some sheets were attached, making removal after installation impossible. The top of a fuel tank once installed is pretty much sealed off to a worker. The same goes for a rear seat cushion or a carpet once it's laid down with seats installed. Door panels often had them taped on one side. Sometimes a worker just didn't bother removing them. That's why you often find them in odd places. I've found build sheets under carpets, behind door panels, under consoles, inside dashboards, under spare tires, inside headliners, inside the backs of bucket seats with hard shells. I've even found one inside a coil spring tower. The point is you have to think like an assembly worker to zero in on a hidden build sheet. It could be anywhere and yes, it could be your car has none. They did remove them where they could. The other factor erasing your chances of finding a sheet are vermin using the paper and sometimes the burlap or cloth from upholstery to make a nest. More than one rare car lost its pedigree this way! The cruelest fate seems to be reserved for build sheets that survived but are covered in soundproofing tar or maybe absorbed sediment between the insulation and paint of a floor board. Some intrepid recoveries have been made by soaking the sheet carefully in mineral spirits and blotting very carefully with paper towels. Relatives of Build Sheets: Remember at the start I mentioned that some documents are described as build sheets but aren't? I'm going to go into this further now and explain their usefulness. One item that shows up frequently in cars is a trim tag from the upholstery shop. The trim card tag has useful information which can confirm the identity and validity of a car thanks to GM's practice of using the body number on the cowl tag to match up to the trim card. Less information is found on Chrysler's trim tags. On GM cars it's usually a cardboard stock one third of an 81/2 by 11 inch page and pre-printed with markings. A computer fills in fields that indicate specific options. Shown below is an example from a 1972 Olds Cutlass 442 coupe. The predominant information on this card is related to the interior components which is important for the upholstery guys. While not a complete build sheet, there are some rather important fields on the cardboard that confirms a car's identity and critical options. On this particular trim tag card, it confirms the body number of the car, which happens to be on the cowl tag. It is a unique number so it's as good as a VIN for identification purposes. Also on this card are various options, C49 which was Canadian Equipment consisting of -35 degree antifreeze and a heater which was mandatory in the Province of Manitoba by law. Also of interest under the COPO & SO (Special Order) column was W29 and Y60 which was the 442 option for the Map and Convenience Lamps package which consisted of under-hood lamp, trunk lamp, glove box lamp and visor vanity mirror. It's interesting to note that the COPO field was used for indicating the 442 option in 1972. It indicated that all Divisions, not just Chevrolet, used the COPO system and in 1972 it indicated a return to batch builds of the big cubic inch muscle cars due to lower demand just as the whole process started in 1964. I have also seen indications that the 1972 GTOs were batch built with orders accumulated by the sales office, then released to various plants to produce in two day runs. They'd switch back to regular model production afterwards until enough orders came in. You might not find a build sheet, but a trim card is a pretty good consolation prize. With Chrysler Products from the early seventies and late sixties, their trim tags were either clear tin or black cardboard with embossed numbers indicating the upholstery color and type of vinyl or cloth used. Even less information was offered than on the GM cards but it would confirm at least what interior your car had if it wasn't switched from another car. Inspection Forms once in a while appear inside a car. These aren't build sheets, rather they were post-assembly check lists to assure that certain standards were met on the job. These were a full page, double-sided and filled with data ranging from trim code with a series of group A glass codes. It moves to a diagram of the car body from above with the side splayed out to mark defects and has fields on the other side from Front End, Doors, Quarters, Roof, Floors, Seats and last, a series of check for the convertible body. On the other side, it continues with Rough Hardware Inspection and Safety Inspection. At the top of that page the style number and body number is usually filled in. This will match the cowl tag as well and is a confirmation of sorts. These rarely show up as usually 1 car out of 50 is flagged for such intense inspection and very few forms are left behind afterwards.